This is great news. I was wondering when a business model competition like this would happen. Hopefully these will replace traditional business plan competitions in a few years. We hosted a business model competition in miniature this weekend in Chicago with the Lean Startup Machine Chicago (http://chicago.theleanstartupmachine.com/). One head of an incubator that participated will now be basing their summer program on the customer development approach. Hope I can audit that class. Looking through the information packet this seems painfully similar to a business plan contest. Writeups in word have been replaced by presentations in powerpoint. How is this forcing students to get out of the building? How is it different from simply a slide deck about a business plan? Great initiative! I hope you get tons of proof that both Universities (and orgs alike) and entrepreneurs shouldn’t be wasting time with pitch contests. Regarding Alex’s model, what do you think of Ash Maurya’s adaptation of the Canvas? I do agree with him that the model needs some adaptation to better suit the needs of Web-based Startups. To be honest I don’t see much of any difference between the two. Osterwalder’s canvas works for the web just fine. All it requires is reading his book and understanding his process. His slideshare page has plenty of examples. The need for the adaptation is actually illustrated in Steve’s example canvas above. 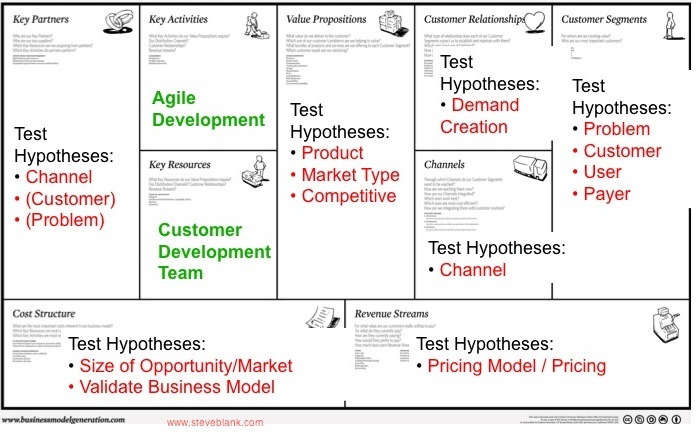 The two green sections (Key Activities and Key Resources) are always the same for any Lean Startup which to me is an awful waste of space. I’d much rather substitute those for elements of the plan that matter – like Key Metrics and Unfair Advantages. Thoughts? I guess this works for a business course. My guess is that people who are just starting out don’t see themselves as searching for a business model. They see themselves as looking for an opportunity. But in a business course I guess people are already past this stage. Great stuff as always Steve. I am using your blog and Alex’s book in my class this fall, and will encourage our students to enter the BYU competition. Completely agree. I used their book as an inspiration for customer discovery. I reference their work in the books section. Steve- as a part of your course, you should require that each team (or person) use a FlipVideo to capture the salient interactions, challenges, guesses, Pivots, and chasm crossing moments of the event. It will make for a great dvd. Your’s and Alex’s books are going to obviate traditional MBAs…! Thanks for your generosity in helping the next generation more agile in business…customers first…who’d have thought. Great Post as always Steve. Combination of both Canvas and Customer Development looks agile framework to search distinctive & repeatable business model to me. I am incredibly thrilled to submit a model for the BMC in January. In fact, this competition could not coincide better with my own plans and ambitions, and will act as an excellent goal/milestone in my personal quest to launch a new venture. More important than me, however, is that you make your class materials for E-245 available for the public, hopefully including lectures. I believe that it would be an incredibly valuable resource and would have the potential to truly kick-start the Durant School of Entrepreneurship. – You can create a business model in education and it can come to light.